It is because of its great vantage point up on a 120-meter-high hill that the castle was used during the Battle of Okinawa in 1945, as a Japanese military anti-aircraft artillery position and, later, a U.S. Forces radar location until it reverted to the local village in the 1970s. The castle was first constructed in the 15th century during the time of three kingdoms, Hokuzan (North), Chuzan (Central), and Nanzan (South). The Central kingdom used this place as its fortress against the north. Today, only the walls and foundation of the castle, which were restored after World War II, remain. At around 1.82 acres wide, Zakimi is smaller in comparison to other castles like Nakagusuku or Shuri. What it lacks in size, however, Zakimi makes up for in fame. It boasts a UNESCO World Heritage Site designation since November 2000 and in 2017, it was picked as one of the Top 100 castles by the Japan Castle Foundation. The castle, which is composed of two plazas and curving stonewalls, is thought to have a military functionality-oriented design, which makes sense given its history. Unlike other castles in Okinawa, Zakimi castle doesn’t have a place of worship. 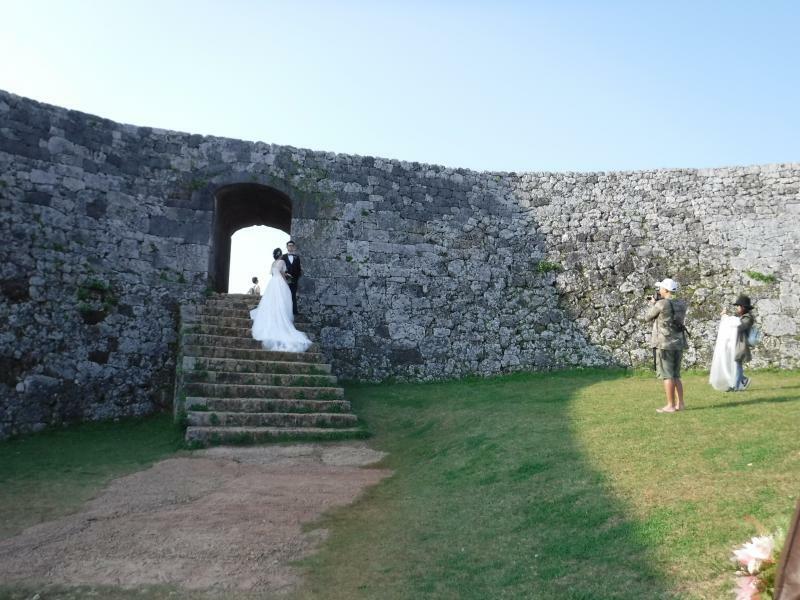 The castle has a subdued beauty which is hard to find at other locations in Okinawa. And its views of the coastline in the west, forests and sugar cane fields around the area, and Naha or even Kerama, Kume and Ie islands, are incomparable. The photogenic castle often hosts entertainment and other events as a “natural theater” location, according to the Yomitan Village Tourism Association. When I visited, a Taiwanese couple was taking wedding photographs with this historic castle and its picturesque vistas as the perfect backdrop. The area quickly filled up with curious tourists eager to catch a glimpse of what was happening. Only a 10-minute drive from Torii Station or a 30-minute drive from Camp Foster, visit Zakimi Castle for its history but stay for the stunning views which will enchant you. * Yuntanza Museum near the entrance of the site offers more information about the castle, artifacts and art related to Yomitan Village history are also on display here. Admission: 200 yen for high school students and above; 160 yen for 65 years or older; free for middle school students and below.